The JCM Opportunity Fund I, LLC is pleased to announce the closing of its latest investment, The St. Regis Residences, Boston. This prestigious development marks the eighth investment for the Fund, which has committed $36 million of invested equity into the project in partnership with The Cronin Group, LLC, a Boston-based commercial and residential real estate developer. The St. Regis Residences, Boston represents only the second all-residential property under the St. Regis banner worldwide, and it brings luxury residential living and the finest amenities available to the Seaport. The 22-story tower, which is projected to have a $500 million stabilized market value, features 114 condominium units, below-ground valet parking, an onsite fine dining restaurant, fitness amenities and professional services. 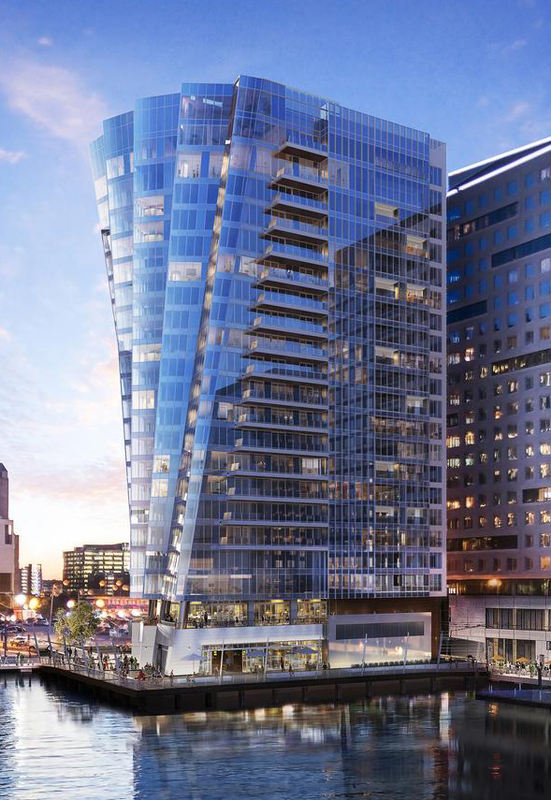 Its striking, innovative design by Elkus Manfredi Architects reflects the nautical origins of the Seaport District and is destined to become a landmark of the Boston skyline. Gary F. Joyal, CEO, Managing Partner and Fund Manager comments, “When Jon Cronin from Cronin Development presented the opportunity for the Fund to be a partner, he walked through a first-class team to make his vision a reality. The legendary architectural firm of Elkus Manfredi was tasked to design the building to resemble the Tall Ships which is in keeping with the nautical importance of the Seaport. The construction team led by John Moriarty & Associates was very important since his construction management company has deep experience in this type of premium build. And lastly, having the St. Regis brand behind everything means that we can be part of a landmark that epitomizes luxury living at its finest, residing on the last developable waterfront parcel of land in the Seaport. With thirty years of experience, Joyal Capital Management, LLC represents high-net-worth individuals and family-owned businesses on mergers and acquisitions, financing, private equity, estate planning and family office services. The JCM Opportunity Fund I, LLC, JCM’s private equity arm, focuses on QSR franchise and real estate investments. For more information, contact Gary Joyal at gjoyal@joycapmgt.com, or 508-747-2237. Learn more about our suite of value-added offerings at www.joycapmgt.com. This JCM Opportunity Fund I, LLC (Fund) announcement is for informational purposes only for the confidential use of the intended recipient. No announcement information may be construed as an offer of, solicitation of an offer to buy, recommendation of, representation of suitability or endorsement of, any security, investment fund, interest in real estate or other investment. Any such offering shall be made only to qualified investors by a private placement memorandum or a similar document containing risk factors and accompanied by other definitive offering documents, distributed by persons authorized by the Fund, and only in those jurisdictions where permitted by applicable law. This announcement is not such an offering document nor shall it serve or be deemed to alter, supersede or amend any such offering document. Any projections or other estimates in this announcement, including estimates of returns or performance, are “forward-looking statements” and are based upon certain assumptions (“Estimates”). Recipients can identify forward-looking statements in this presentation by the use of terminology such as “may,” “will,” “seek,” “target,” “expect,” “anticipate,” “project,” “should,” “believe,” “intend,” “plan,” “estimate,” “predict,” “potential,” “continue” or the negative thereof or other variations thereon or comparable terminology. Other events, which were not taken into account, may occur and may significantly affect the analyses. Any assumptions should not be construed to be indicative of the actual events that will occur. Actual events are difficult to predict and may depend upon factors that are beyond the JCM Opportunity Fund I, LLC's control. Certain assumptions have been made to simplify the presentation and, accordingly, actual results may differ, perhaps materially, from Estimates presented. The JCM Opportunity Fund I, LLC cannot make any assurances that Estimates can be realized or that actual results will not be materially lower than the Estimates. Such Estimates should be viewed as hypothetical and do not represent the actual returns that may be achieved. Recipients should conduct their own analysis using such assumptions as they deem appropriate and should fully consider other available information.